One of the most famous pieces of artwork, Irises was painted by Vincent van Gogh in 1889. Created during his stay at an asylum in France, Irises was inspired by the flower gardens that encompassed the hospital. Van Gogh used nature and the walls around him as inspiration to paint more than 130 paintings. Irises is one of Van Gogh’s paintings that has a stillness and beauty not seen in many of his later works. The Japanese wood-block influence is seen heavily in this painting. His use of unique angles, up front views and strong lines were very apparent. In addition, the element of dark contours in his flowers showed the great influence Japanese wood-blocking played in his works. The technique of Japanese artist Hokusai was executed by Van Gogh with precision. The use of vibrant blue and violet bring the petals to life. This also created an illusion of movement and depth to the flowers. Van Gogh placed the irises unevenly on the page, making the flowers the focal point. The painting is also closely cropped to draw in the eye, while deep crimson soil show the variety of colors Van Gogh wanted to work with. These are all techniques taken from Hokusai. Van Gogh added to his work however by placing a batch of orange marigolds carefully in the background. The position of a single white iris begs many questions from the viewer that are still open for interpretation. 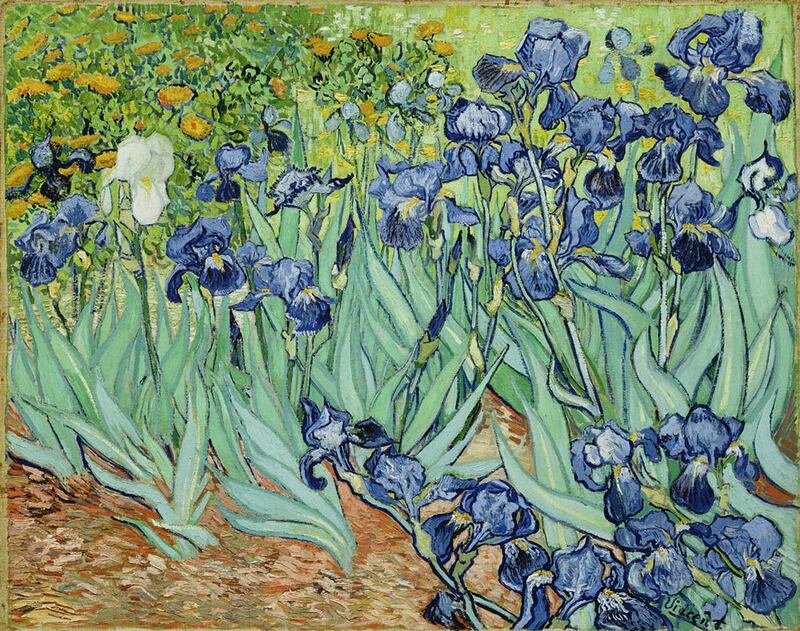 Currently one of the most expensive paintings, Irises shows Van Gogh’s ability to use his surroundings to paint bold images that have depth and character. Although painted during a time of suffering for Van Gogh, he was able to channel that energy into turning bright colors, deep contour and flat paint into works of art. His influence is forever felt amongst admirers and artists alike.